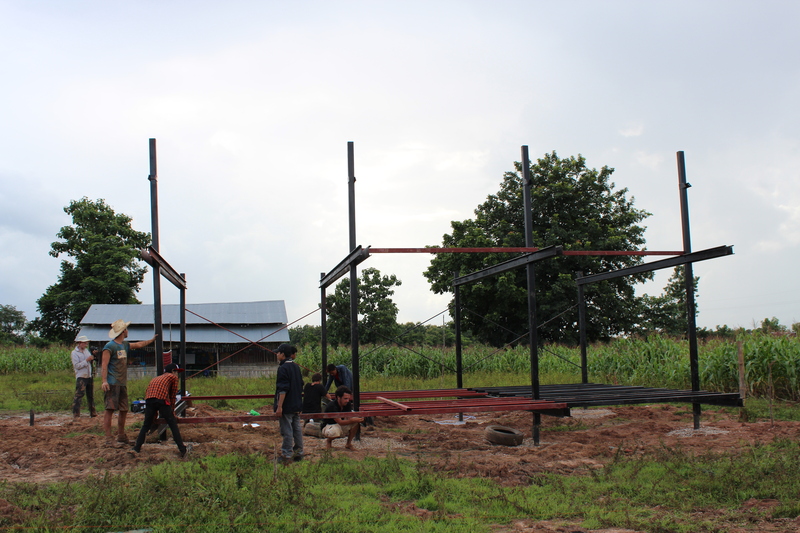 UPDATE: Moving Schools project – The roof and flooring arrive! After a fantastic weekend constructing the ten school modules on site, we were eager for the arrival of the roofing fabric and flooring which would turn the steel frame structures into a school building. We received notice on Sunday morning that the UV resistant fabric for the roof had arrived in Bangkok from Germany via Oman. 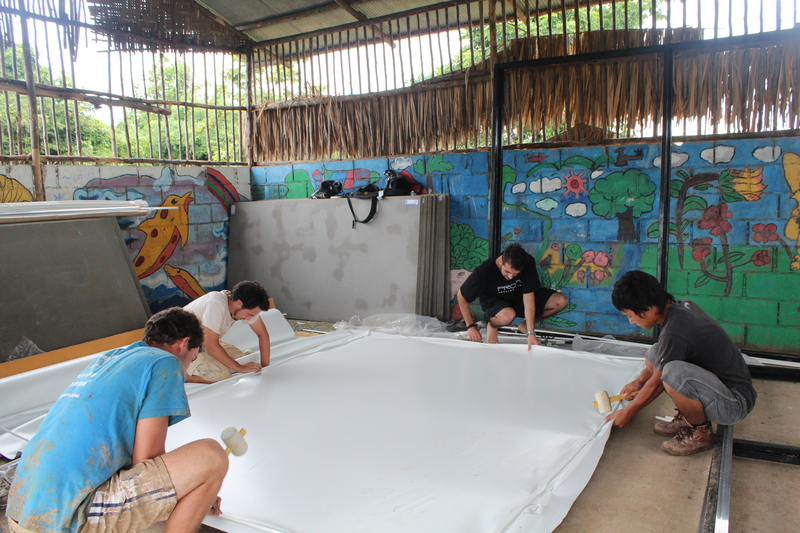 The fabric was very kindly donated to Building Trust by Mehler Texnologies a German company, who offered to provide the fabric for the school project free of charge we then had to pay the shipping cost by air to Thailand. We also awaited the arrival of the flooring which is made from a cementitious wood board by a Thai company called Viva Board. 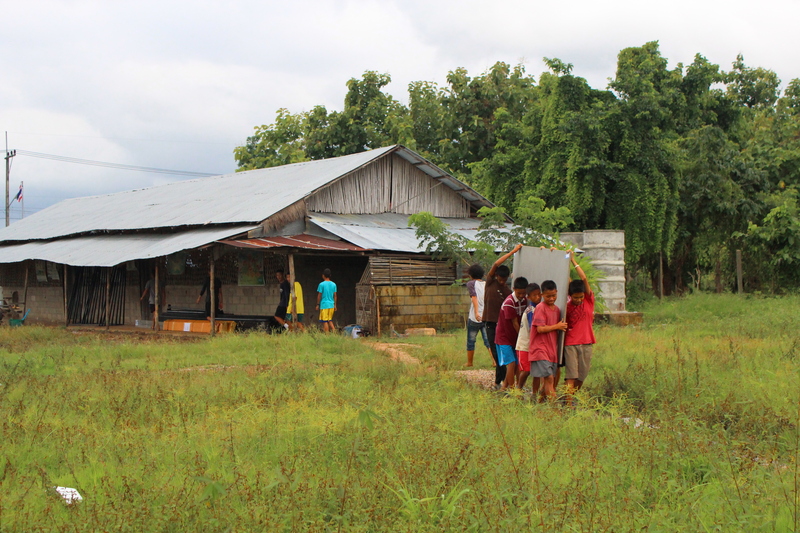 The cementitious wood board looks very similar to the familiar concrete flooring often found in Mae Sot schools, however the vital difference is that the Viva Board can be taken with the school community if they have to move the school in the future. Another package awaiting delivery from Bangkok were the aluminium extrusions, a product by French company Profil Tensions Systems which would hold the PVC membrane to the steel frame. 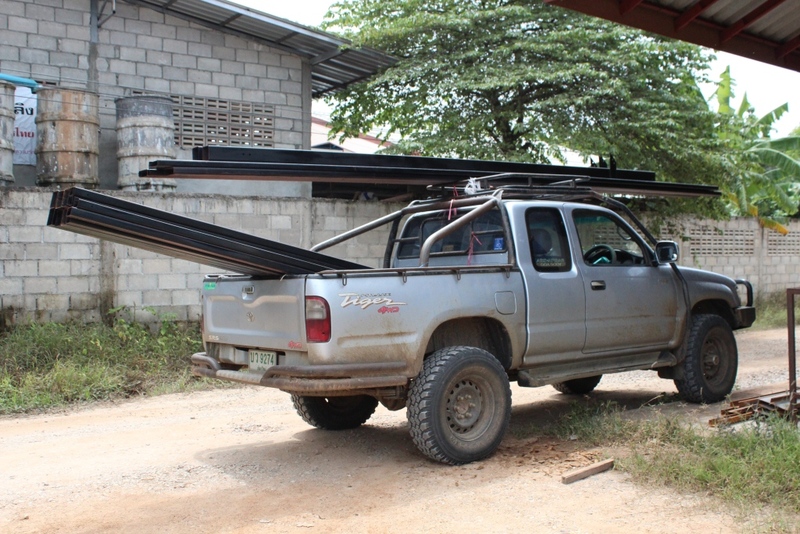 After a few days of long, arduous and frustrating phone conversations, trying our hardest to get the fabric released from customs at Bangkok airport we received the great news that on Wednesday afternoon the flooring, extrusions and roofing were on a truck from Bangkok to Mae Sot. 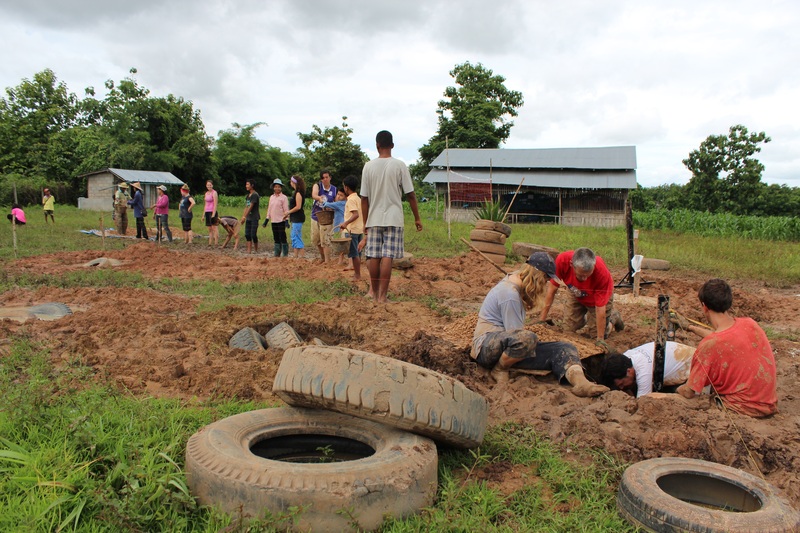 As the truck made it’s way to Mae Sot the volunteers spent 2 days completing 8 foundation holes for the central courtyard. Instead of using truck tyres and digging three tyres deep for the courtyard foundations, we used a smaller car tyres. We were able to use a smaller system for the central courtyard as there will be very little imposed loads on this area of the school. As the final courtyard foundation hole was finished, the truck from Bangkok arrived and the volunteers, David and I wondered how on Earth we would be able to unload the truck containing all the flooring and roofing materials for the school construction. As we tried to come up with the easiest solutions to unload and called friends to see if they could help, out of nowhere a group of 50 students from the school next door, who had just finished playing football started walking in droves up the road. They all huddled together around the back off the truck and looked up to David & the workshop guys to unload the material to them. It was as if by magic a team of incredible, strong children showed up to help us unload. 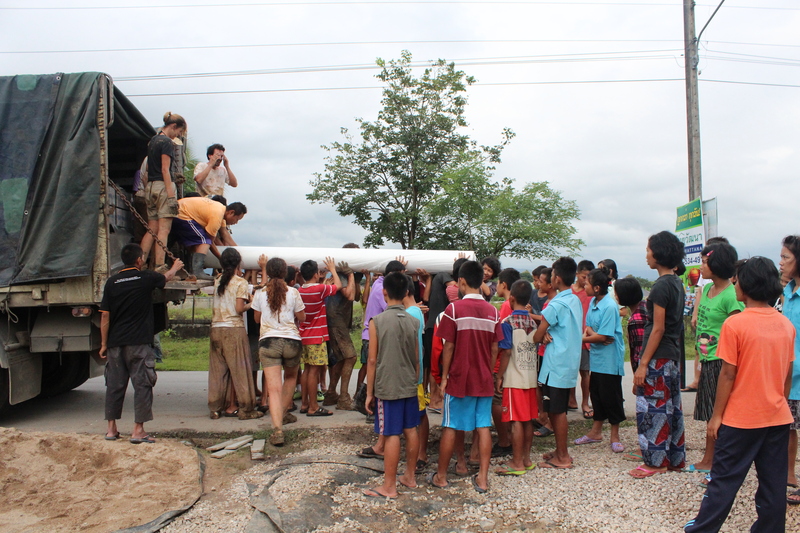 Ranging in ages from 6 – 16, they lifted the rolls of plastic roofing into the school site. With 10 children to a roll the roofing was quickly brought into the school site. Next to be unloaded were the large Viva Boards for the flooring. Over the next hour 140 pieces of Viva board were carried piece by piece into the site, where I stood directing the children where to place the materials. It was fantastic to see how eager and enthusiastic the children were to help out. 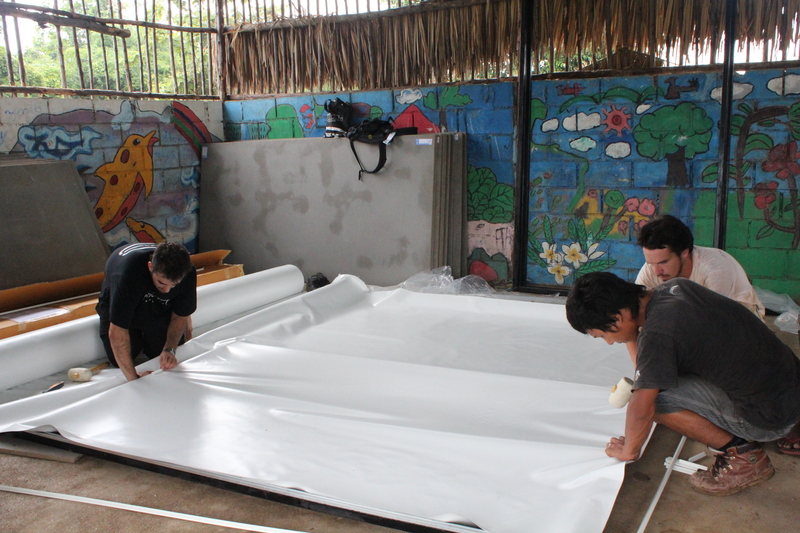 We were so relieved that the fabric and roofing materials had arrived safely from Bangkok and could not quite believe the experience of unloading the truck. We truly believed someone/something was looking out for us. After an action packed afternoon on Friday, Saturday morning we were to begin work on the roofing sections. There are two sections to the roof, a small roof and one larger roof. Both steel frame roof sections need to be fitted with aluminium extrusions, which hold the plastic roofing material in place. 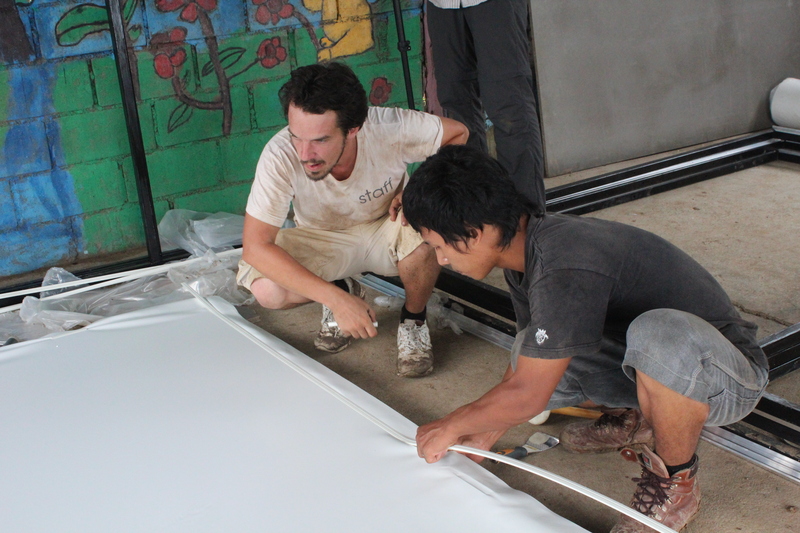 Adrien from Profil Tension System very kindly flew up from Bangkok to show us how to construct the aluminium and roofing sections. First the aluminium extrusions are connected to the steel frame with self tapping screws at approx. 200mm centres. The fabric is then rolled out over the steel frame and cut to the correct size. Small plastic extrusions are then tapped into place at four points across the frame to keep the fabric in place. The four small plastic extrusions are then removed as a larger piece of plastic extrusion is fitted to the roofing section as the plastic is stretched and tightened across the frame. When the plastic is stretched and tight across the whole roof, then a second layer of aluminium is fitted on top. The process of fitting aluminium extrusions to plastic onto steel roofing frame took the team just under one hour to complete. Now to complete another 9 small frames and 10 large frames! It was great to see how fantastic the roofing fabric looked against the steel frame and when tested under the rain we could see how resistant the fabric was to the weather and how little noise could be heard when the rain hit the plastic surface. This would be a huge change to the current tin roof which is very noisy and only lasts a few years. We hope that the plastic roof will last for 5-10 years, Chan Chan the Headmistress smiled from ear to ear as she visited the school site and the weekend to see the fabric roofing material. This will be the first of its kind and we hope will make a dramatic improvement to the education of the children at Thu Kha Hang Sar. We now wait for a break in the rain to place the 10 small and 10 large roofs onto the steel modules. We hope that we will be able to have the roof up over the next few days. 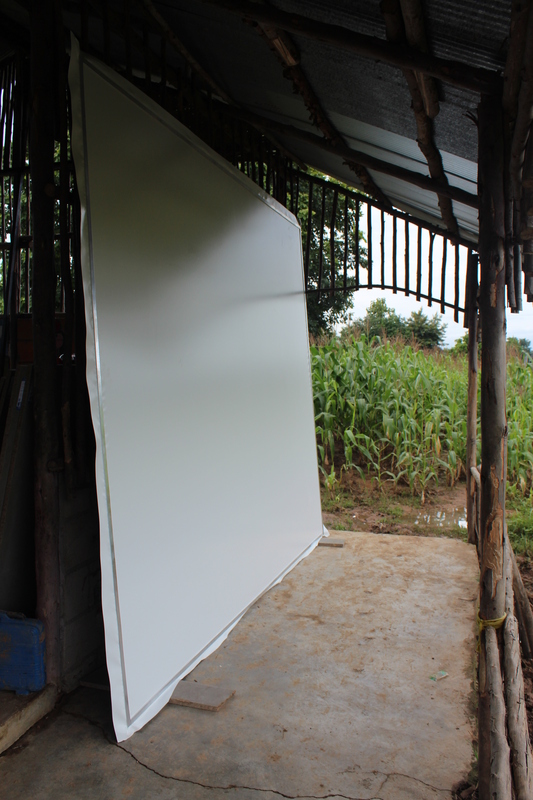 This will allow us to have a dry area where we can begin to fit the Viva board flooring and insert the bamboo wall panels into the school structure. 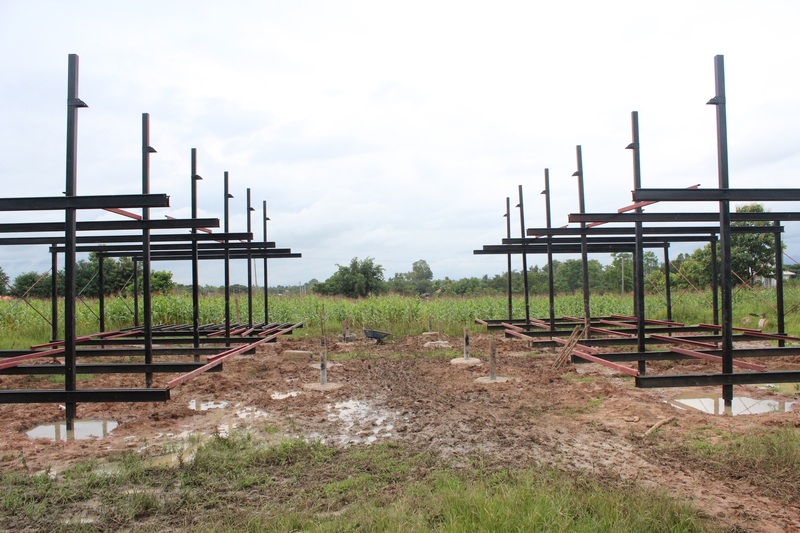 LIVE UPDATE: Moving Schools project – Frames for School modules are up! 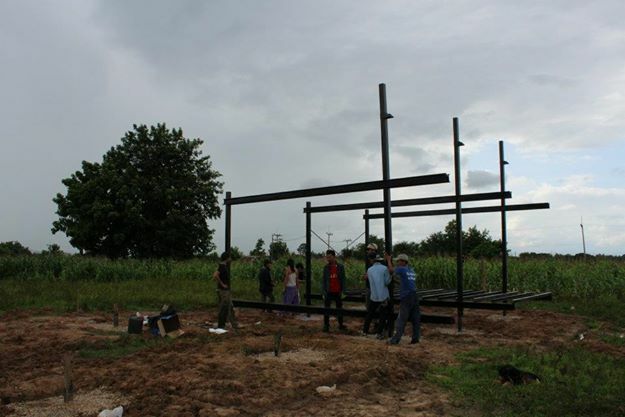 After a successful day placing the first school frame into position, everyone from teachers and students to volunteers were very excited about the upcoming weeks and the fast progress, happening on the build. 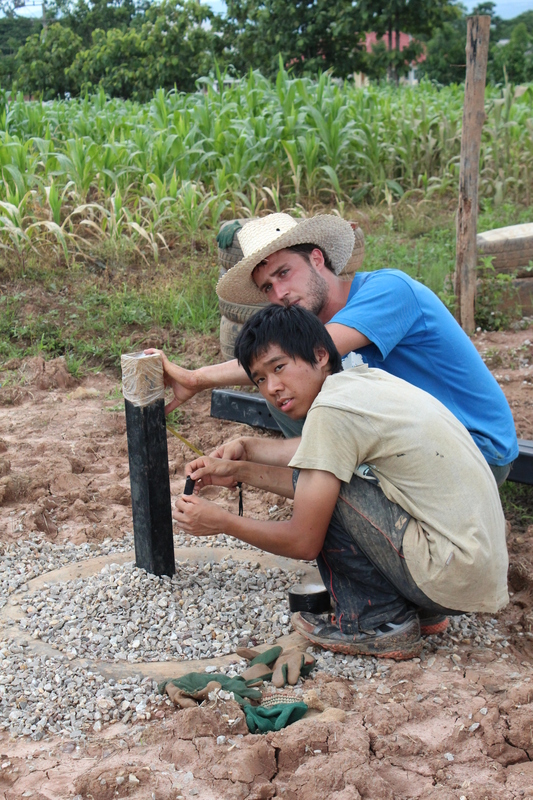 We spent the next week finishing the remaining foundation posts on the second line of the classrooms. It was very rewarding to see the first school module in the corner of the site, a reminder of the success that comes from the hard work of digging and fitting the foundation posts. In an effort to recruit further volunteers to assist with the build, we placed posters throughout Mae Sot in guesthouses and cafes to entice more people to help out. We were very happy to receive a call from a Belgian family who saw our poster and thought a few days volunteering on our school project would be a great way to spend time on their holiday. Hans, An, Emile and Yann were a great boost of energy to our project, Hans helped David, Pablo and Jim with foundations while An and her sons Emile (10) and Yann (5) helped me with painting. It was great to see a family taking a month break from work to enjoy family time in Thailand and also help out with a volunteering project. Our youngest volunteers so far were definitely the most energetic painting the ceiling and flooring frames in no time at all. When we originally visited Mae Sot in January 2011, we were shown around some of the school buildings by a Spanish NGO, Colabora Birmania. We have since stayed in touch with the NGO and were very lucky to be offered three new Spanish volunteers to help out on the build. David, Guiomar and Izaga are in Mae Sot for a month and have very kindly offered to volunteer on our ‘Moving Schools’ project. They quickly got to grips with the task of fitting foundation posts. 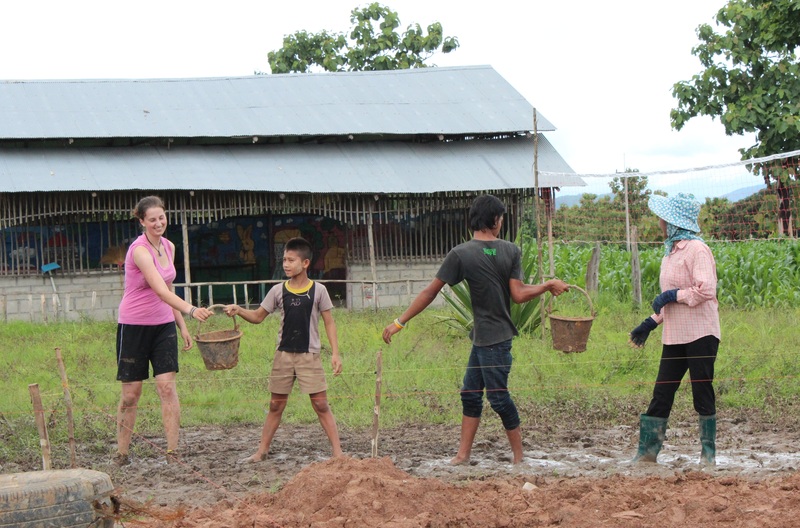 It was easy to keep momentum up when carrying out the foundation posts as we could see the eager to learn children being taught outside their current school classroom to allow the teacher the much needed further space and quiet area she needed to teach. 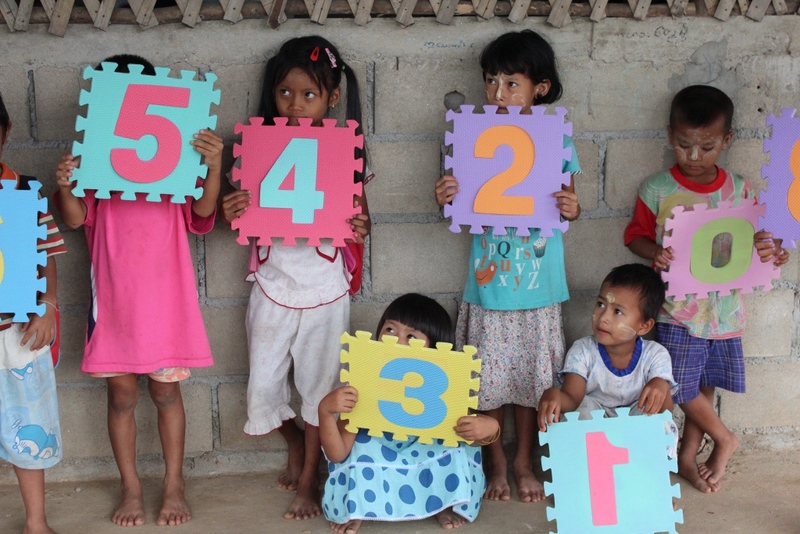 We saw the children playing a number game with their teacher with a game kindly donated by Imagine Thailand. We look forward to seeing the teacher and her students playing the number game in their newly built school classrooms very soon. With only two weeks left until we fly home, we placed a deadline as to when all the steel had to be cut, painted and drilled at the workshop. We were very glad to see the workshop team work through the weekend to ensure all steel was ready in time. 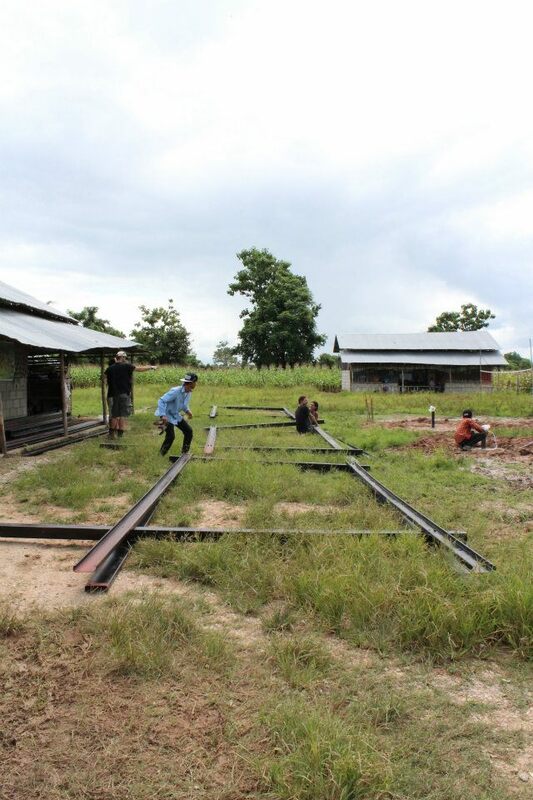 On Friday, we hired a 6 wheel truck to move all the steel to construct the school project from the Global Neighbors workshop to Thu Kha Hang Sar school. With our newly trained volunteers and a few spare hands courtesy of the workers from the Two Wheels Bike shop we had a team in place to move the steel to site. As we patiently waited at the workshop for the driver to arrive, excitement was building as our team knew today we would hopefully assemble all the frames. Quickly the piles of the steel around the workshop decreased and within an hour the truck was fully loaded and ready to travel to the school site. 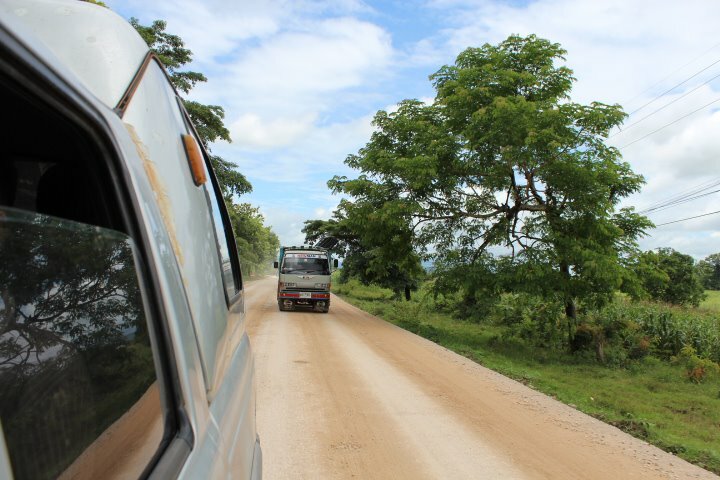 David, our volunteers and I jumped into our truck and led the 6 wheel truck to the school site. We travelled through the small village of Mae Pa where we tightly squeezed through narrow roads passing day markets and buffalo’s on the road. 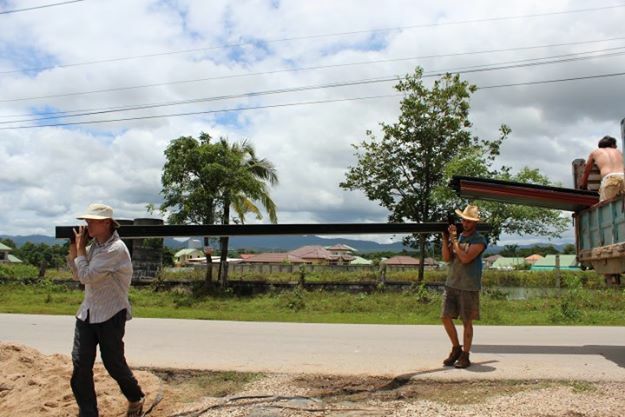 Driving through rice paddy fields, we saw workers carrying out their daily chores and then finally we drove up the final small hill to the school to see our first module standing proud through the corn fields. It was exciting to know we were about to construct 9 further modules. 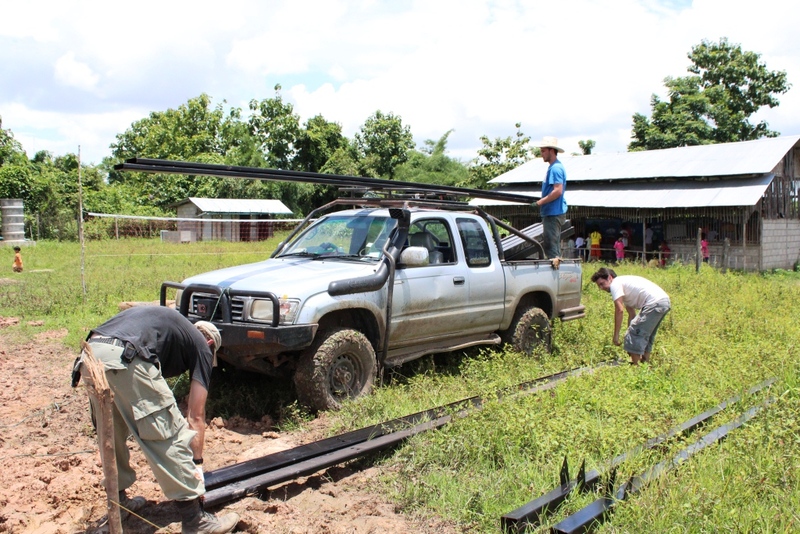 As the sun came out over lunch time, the team prepared to remove the very hot steel from the truck into the school grounds. We spoke with Chan Chan the school headmistress to explain that the children needed to stay inside while the steel was moved. As the piles of steel from the truck were slowly moved in the mid day sun to the school, we could hear the children inside standing on their tip toes to see what we were doing. Chan Chan told the children that we would be building the remaining school frames and they spoke to her with excitement and asked when they could be taught in the new school. It was great to know that both the teachers and students were excited about their new school building. The next task was to lay out the steel into position on the floor and bolt together. The frames could then be lifted up moved into place next to foundation holes and slotted into position. Thu Kha Hang Sar school sadly had their electricity cables stolen recently therefore there is no electricity on site. With no power to charge the tools needed to construct the frames, we managed to hire a generator which powered the drills needed for the build. 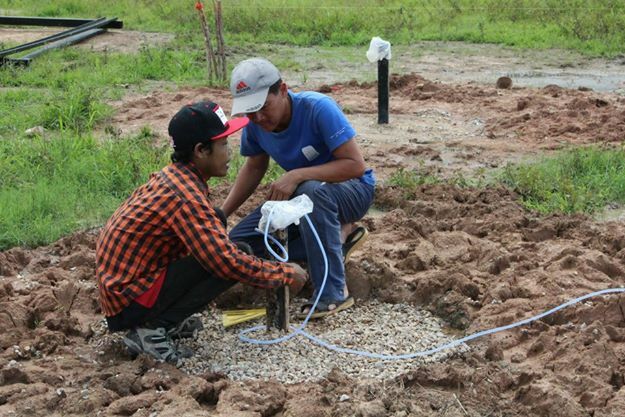 As the majority of the team constructed the frames on the school grounds, workers Nain and Aung Myint Soe tested the water level across the school and marked out where the holes to place the frames were to be drilled. The team quickly got the hang of moving the frame into position and were quickly slotting the frames into place. Finally the first line of modules is complete with the 4th and 5th module in place. With daylight ending, we decided to re-group the next day to finish the second row of modules. We met bright and early on Saturday morning and managed to put up the remaining frames during the hours when the rain stopped. It was incredible to see the frames on the school site, it gave us a real sense of what the final building will look like. Chan Chan and the teachers arrived to school on Monday morning and were very happy to see their new school building really taking shape. 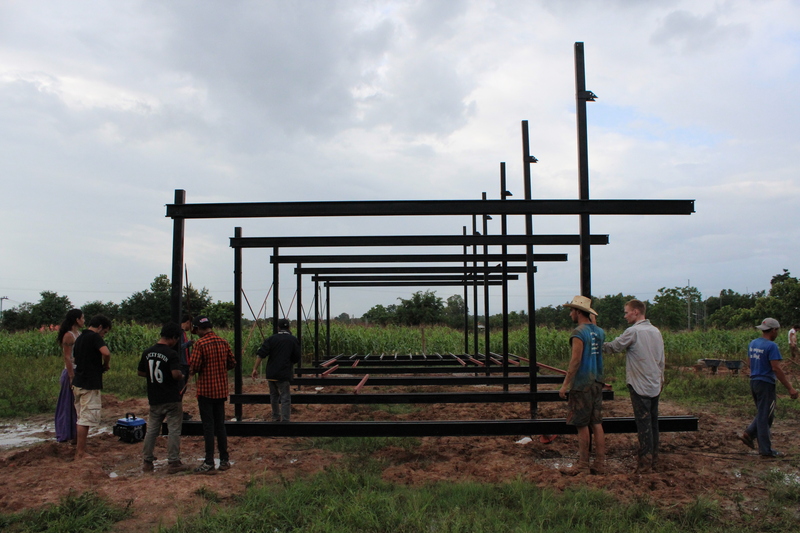 Now we wait patiently for the roofing and flooring to arrive from Bangkok which we hope to install at the weekend. 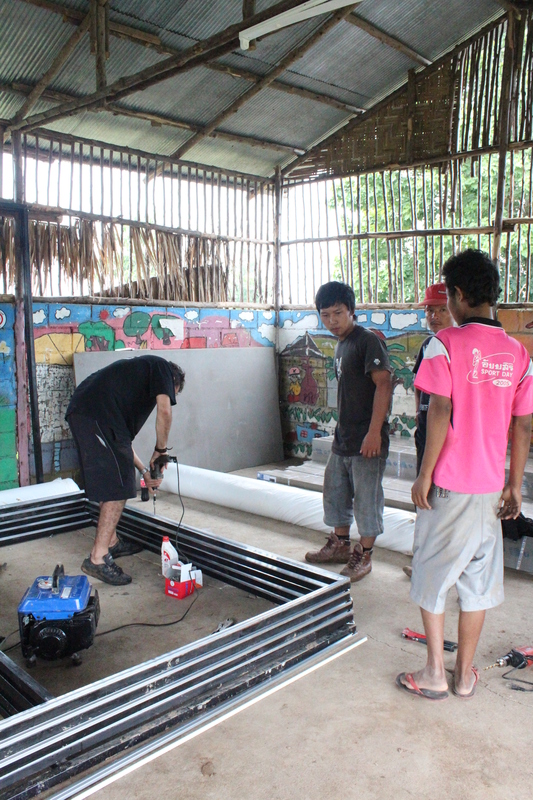 Meanwhile, the workshop team are still very busy construction the bamboo wall panels and the remaining roof frames. A very busy and exciting few weeks are in store! After another successful weekend with new volunteers helping on the school site we were happy with the progress being made. It was great to have volunteers from the UK and Canada working alongside the school teachers and students on their Saturday morning. With the number of long term volunteers slowly depleting it was great to see the arrival of Pablo from Guatemala on Saturday, a civil engineer who will be helping us out in Mae Sot until the end of the project. 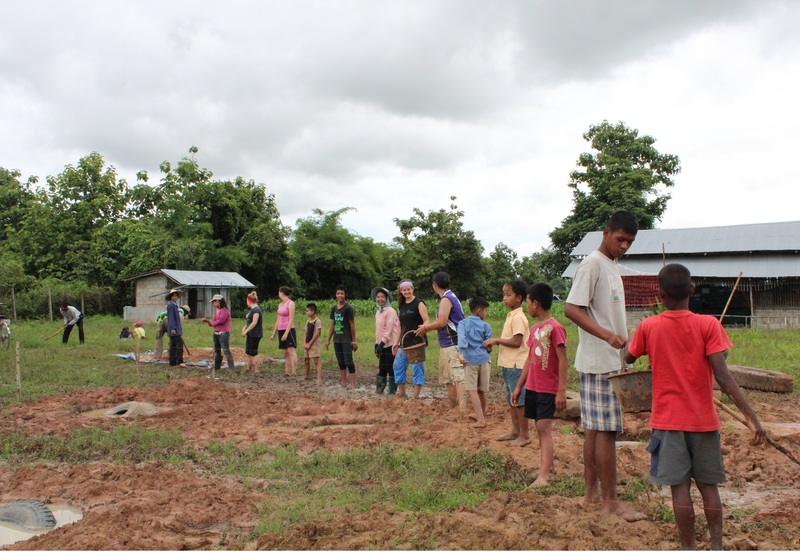 We also gained a few days volunteering assistance from Wen an Architect who had travelled from Kuala Lumpur, Malaysia to assist with the build. 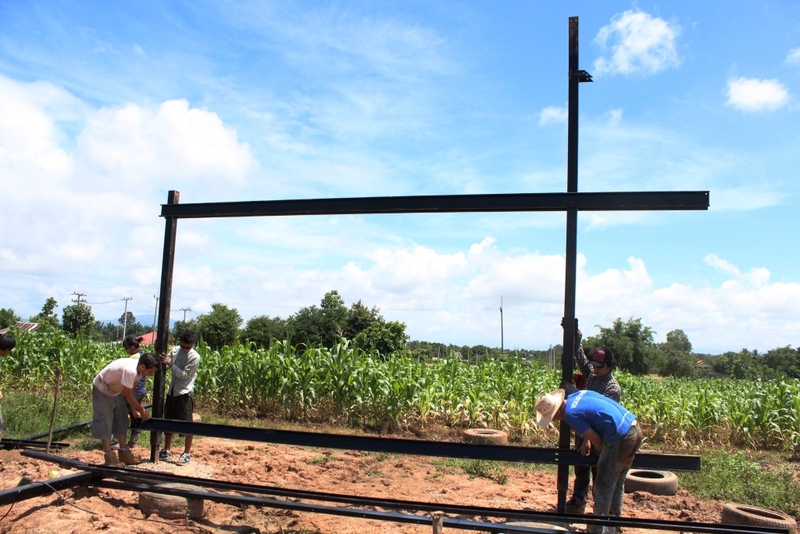 On Tuesday, we received news from the workshop that they had finished cutting, drilling, painting and welding one set of steel frames to construct one school module. With this good news David, Pablo, Jim, Wen and I went to the school site to prepare the foundations posts for the arrival of the steel frames. In order to ensure we have the same height across the site, we purchased a 10 meter length of clear plastic tubing to use as a water level. Pablo had recently used this technique on a project build in Guatemala so was able to explain and show the very clever, simple process of ensuring the height across all foundation posts. 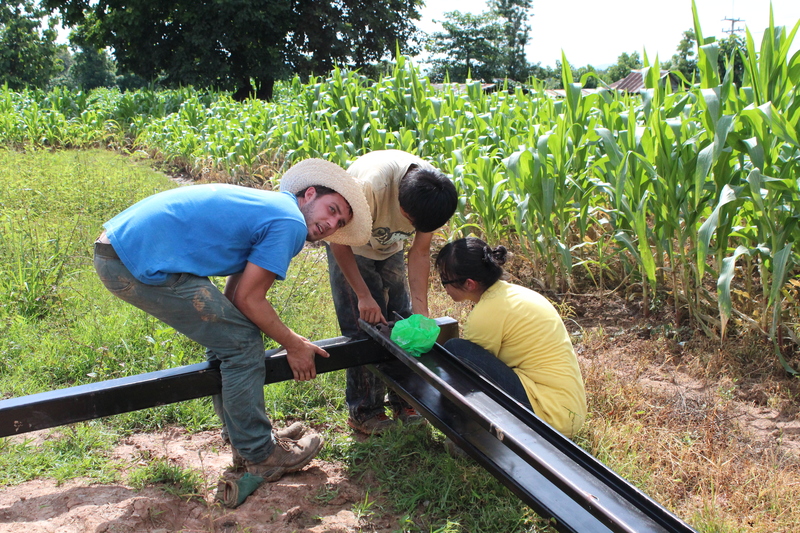 The ends of the plastic tubing are held vertical, and the rest of the tubing lies on the ground. 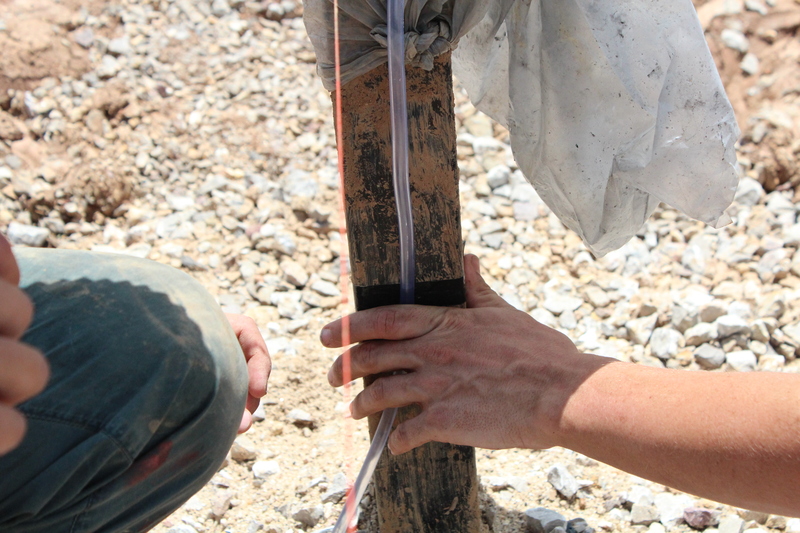 The tube is filled with water, then two people hold the tube and one foundation post is chosen as the reference point. 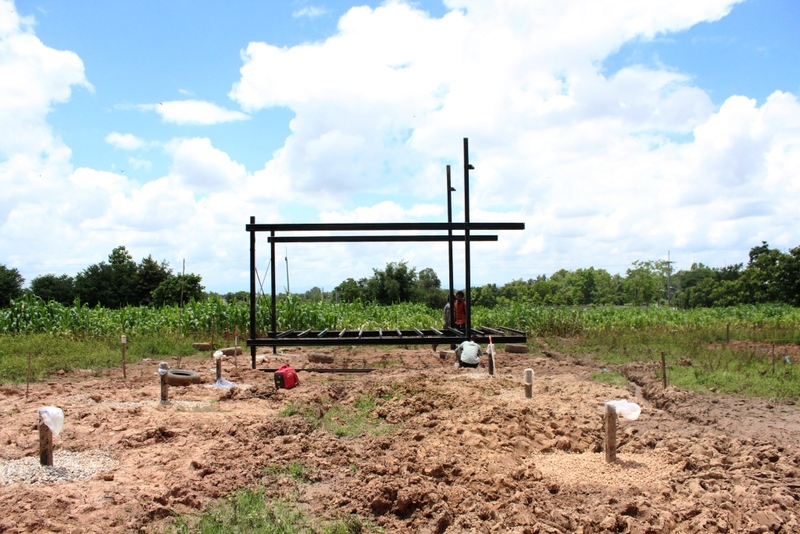 With foundation post chosen, one person stays at the post and holds the tube against the post and waits until the water levels out. The water level at each end of the tube will be at the same elevation, whether the two ends are adjacent or far apart. Then at a second foundation post the other person holds their section of tubing against the second post and waits till the water stops moving up and down. When the water is still the level is marked on the reference post and then on the second post. This process is repeated across all foundation posts using the reference post against each post. A very simple method indeed! 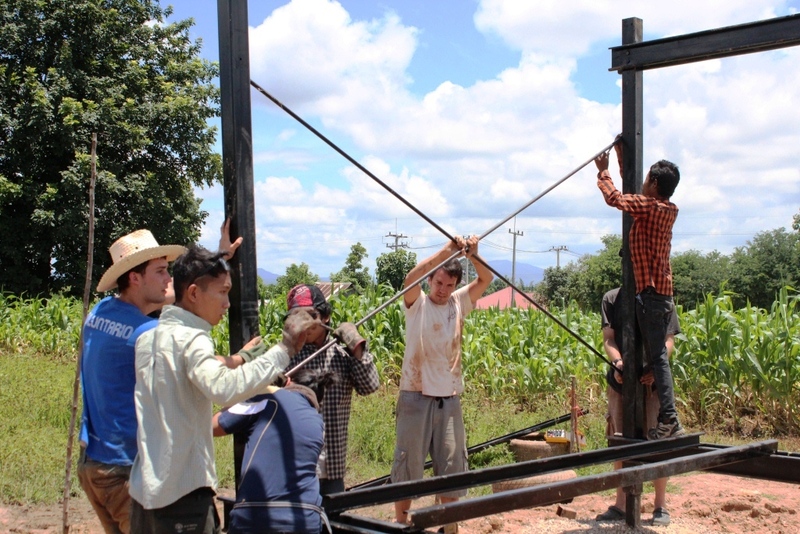 On Wednesday, we headed up to the workshop and started loading a truck with the steel for one classroom module. The workshop apprentices drill out the final holes in the foundation posts on site to ensure all sections are fitted to the correct measurements. The steel columns are laid out on the ground and positioned into place with the floor panels and ceiling sections, which are bolted together. This will allow the two sections of the frame to be lifted up into place over the foundation posts and then bolted together. When two frames are fitted to foundation posts the structure is secure, however we add a cross brace across the frames for additional support. 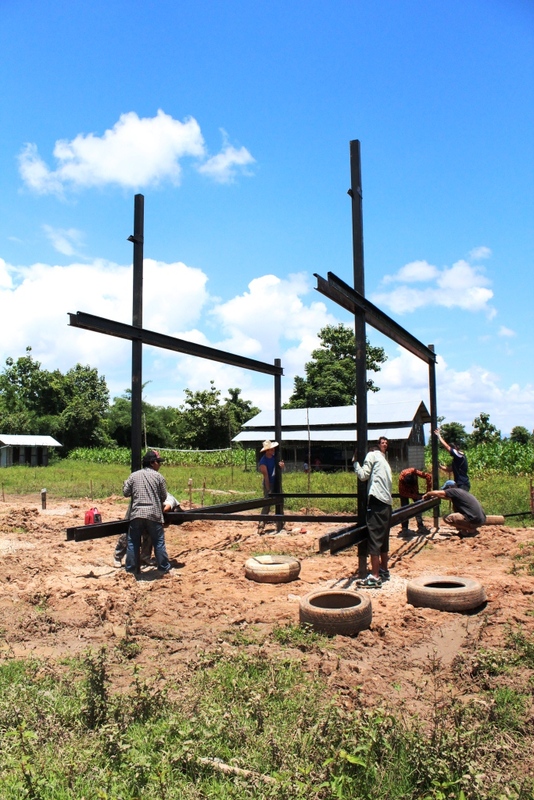 Next the floor sections are bolted onto the frames, soon we will add the roofing, bamboo wall panels and floor panels onto the school modules but first we must finish the remaining foundation posts and fit the classroom frames into place. The workshop are now planning to work over the weekend and we hope all ten modules will be fitted over the next few weeks. On Saturday morning, the remaining volunteers, David and I travelled up to the school site ready to start another day of foundation work. As we walked on to site we looked behind and saw a large truck dropping off a great number of people. 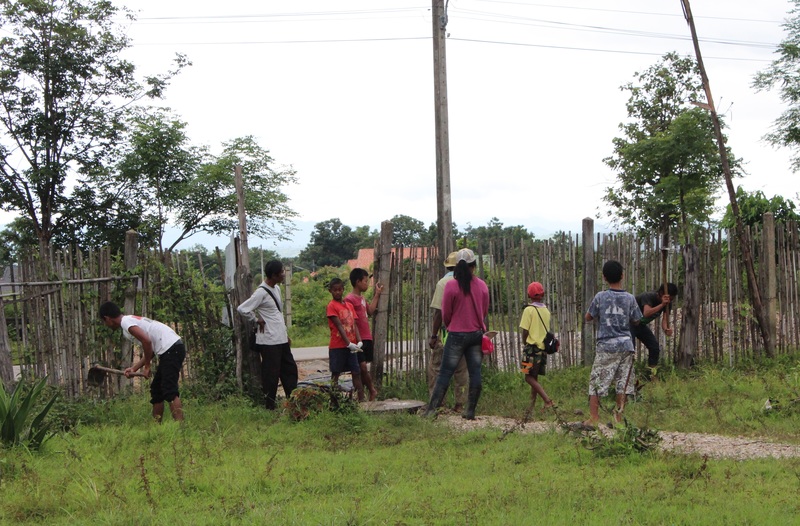 Slowly one by one they walked through the school gates with tools in hand, the children’s parents had arrived to help! With the majority of our volunteers leaving last Tuesday we were not sure how many people we would have to help over the weekend and were pleasantly surprised with the influx of new recruits! Along with the parents a new group of Canadian volunteers arrived, five girls who are currently teaching at migrant schools in the area. They kindly offered their Saturday to help out on site, draining a further foundation hole. It was great to see volunteers, children and their parents getting along and helping out. By creating a long chain the gravel was passed to the foundation hole quickly and in no time at all the foundation post and three truck tyres were placed in the foundation hole and filled with gravel and sand. It was fantastic to see everyone working together as a team to carry out the task in hand in a quick and efficient manner. It would be great to have such a great team of volunteer on site everyday! The parents will be helping us out on the school site every Saturday over the next month, it is fantastic to have their assistance and see that they are very positive about the school design and want to help out in anyway they can. 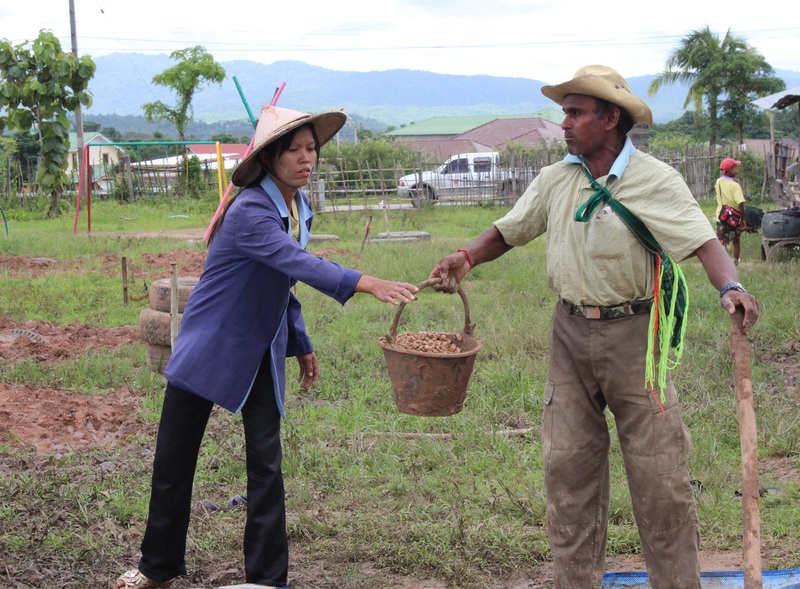 We are looking forward to working with them this Saturday where we have also been promised some tasty Burmese food for lunch after a hard morning working on site. 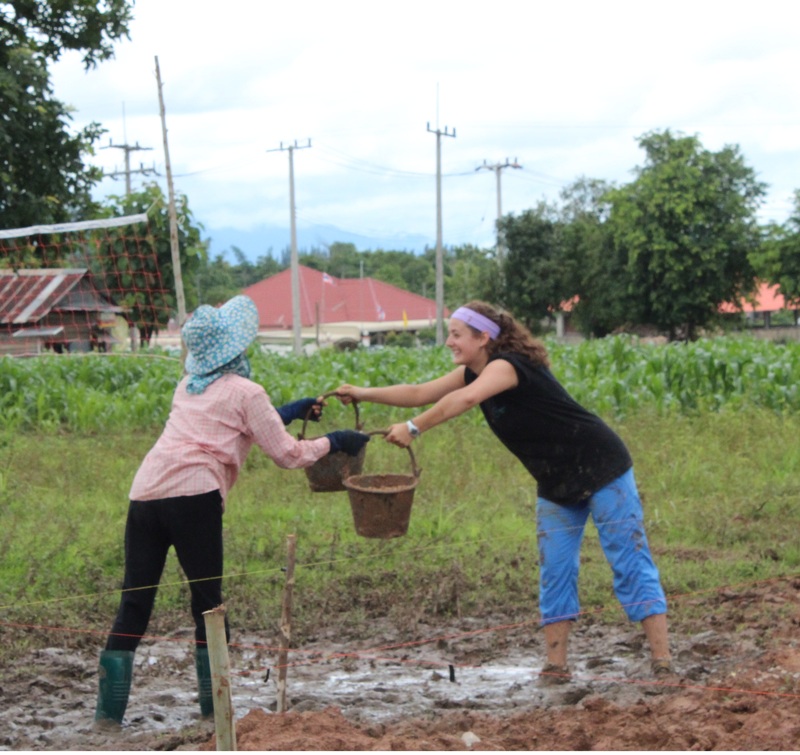 If you are in the Mae Sot area and are interested in helping out volunteering on the school build please do get in touch. We are always open to people willing to give their time to help out in anyway they can.